He is a darling of the Gor Mahia fans, Some have gone to the extent of calling him “Ngwachwaa” loosely translating to mean “Our Ngwa”. He came back to Kenya at the Start of this year after a one season spell in Tunisia and he says that his experience in North Africa taught him so many aspects of life and more so professional football. Born on the night of May 22nd in 1990 in a small Cameroonian town Buea, Ngwa always had the admiration and passion for soccer and at just the age of seven, he was already enrolled in an academy; The Mt. Cameroon Academy where he played for four years. He later on moved to the Brassaries of Cameroon Academy where he spent another 3 years, horning his soccer skills, this is the same place that the likes of Samuel Eto’o, Alex Song, Patrick Mboma, Geremi Njitap among other Cameroon greats started out their soccer careers. After spending three years there, he moved back to Mt. Cameroon, this time playing for their senior team that was participating in the Division II League, at just the tender age of 15. After a two year spell in second division, he moved to the Premier league, at the age of seventeen where he signed with Bomboutous of Mbuda.The now ousted Gor Mahia Coach Anaba Awono was the coach of the Club and that was the first meeting between Ngwa and Awono.The team finished 6th in the league with Ngwa emerging as the Top scorer with 12 goals, in only his first season in the premier league. In the 2008/2009 season, he moved to another Premiership Club, Caiman of Douala which finished fifth in the league and Ngwa managing to score five goals for them. It was after this season that Ngwa moved to The Kenyan Premier League. “Playing for the two premier League teams was a high for me as a player and it taught me great things. The two teams were like Gor Mahia, the pressure was extremely high”, Ngwa says in an exclusive interview with Michezoafrika.com. “I moved to Kenya in February 2009 where I signed with Gor. I could not immediately play as the transfer window was already closed. I waited until June. I remember I scored my first goal for Gor against Western Stima and that goal proved to be important as we went on to win the match 1-0. I think that I had a really good time in 2009 because with my five goals, I helped the team move from bottom of the table to a 6th placed finish at the end of the season”, Ngwa continues. He recalls 2010 as one of the best years ever in his young career. “In the first leg, I was dogged with many injuries and I had very little play time. But when I came back fully fit in the second leg, we won all our matches and pushed up to a second place finish in the league. I scored five goals in the second leg and I was really happy with my achievement”, he says. In 2011, he moved to Tunisia, a move he says was very hard for him. He also says that life in Tunisia was not that easy. “This is a club that I love with all of my heart and I would do anything just to see it prosper. The Chairman was always in contact with me when I was in Tunisia and he always said that I would be welcome if I needed to get back here”, he adds. He says that this season, he aims to put his best for the club and says that he is gunning for the golden boot. “I am back here for business and unfinished business for that matter. I want to see Gor Mahia winning the KPL trophy and for myself, I want to win as many player of the months awards and as many man of the match awards. Above that I want to win the golden boot. I Know that the tables will turn for us soon and we are going to get back on top”, he adds. Ngwa says that he expects to make a move to Europe after some time with Gor, saying that he has links in Romania and England. “First of all, I want to work so hard so that I can get caps to the national team even if it is the Under 23 team. I know that I can make it big because I want to play in Europe. I have been called to the national Under 23 side twice and played against Congo in 2009. I want to work hard and improve those caps”, he adds. 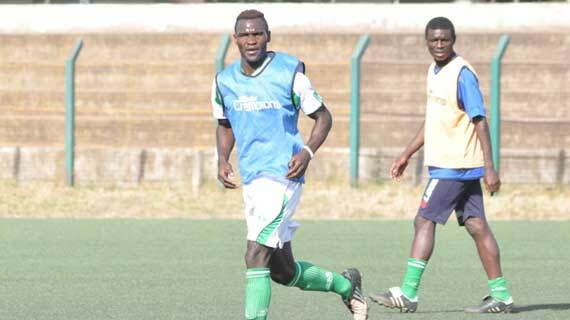 Ngwa scored two goals on Sunday when Gor Mahia thumped Embakasi combined 9-0 in a friendly match.